BTS256-LED tester for the luminous flux measurement of individual light emitting diodes up to 800 lm. Compact meter with an incorporated integrating sphere. Cone-shaped measurement port for assembled LEDs. Auxiliary lamps. Light meter with Bi-Technology sensor for acurate measurement of the luminous flux, spectral radiant power, color temperature, Ra and R1 to R15 color rendering index, xy and u’v’ chromaticity coordinates and XYZ color values. User software. BTS256-E WiFi for the illuminance and light color measurement of LEDs and other light fixtures. Bi-Technology light sensor for acurate measurement of the photopic and scotopic Ep and Es illuminance in lx (luxmeter), determination of the Es/Ep ratio and EVE coefficient, the spectral irradiance, color temperature, Ra and R1 to R15 color rendering index, xy and u’v’ color points and XYZ color values. Data storage with logger function. Mobile light meter with USB and WiFi interface. User software. BTS256-EF WiFi for the illuminance, light color and flicker measurement of LEDs and other light fixtures. Mobile light meter with Bi-Technology sensor for acurate measurement of the photopic and scotopic Ep and Es illuminance in lx (luxmeter), determination of the Es/Ep ratio and the EVE coefficient, flicker, the spectral irradiance, color temperature, R1 to R15 color rendering index, xy and u’v’ color points and XYZ color data. Data storage with logger function. Mobile lightmeter with USB and WiFi interface. User software. X91 photometer for illuminance and luminance. Mobile light meter for the measurement of illuminance in lx and luminance in cd/m². X91-US version for measurement of the illuminance in fc and luminance in fL. High quality light meter for both laboratory and mobile use. Optional photometric and radiometric measurement heads for different measurements. P- 9710-1 optometer designed for universal use. Measurement functions: CW, dose, peak-to-peak, pulse energy for both single and multiple flashes, effective luminous intensity (Blondel-Rey) blinking lights, data logger. Battery and AC operation. RS232 interface. P- 9710-2 optometer for energy measurement of both single and multiple pulses. Measurement functions: CW, dose, peak-to-peak, effective luminous intensity (Blondel-Rey) blinking lights, data logger. Signal amplifier with 20ms rise time in all gain levels. Battery and AC operation. RS232 interface. P- 9710-4 optometer for energy measurement of both single and multiple pulses with trigger input. 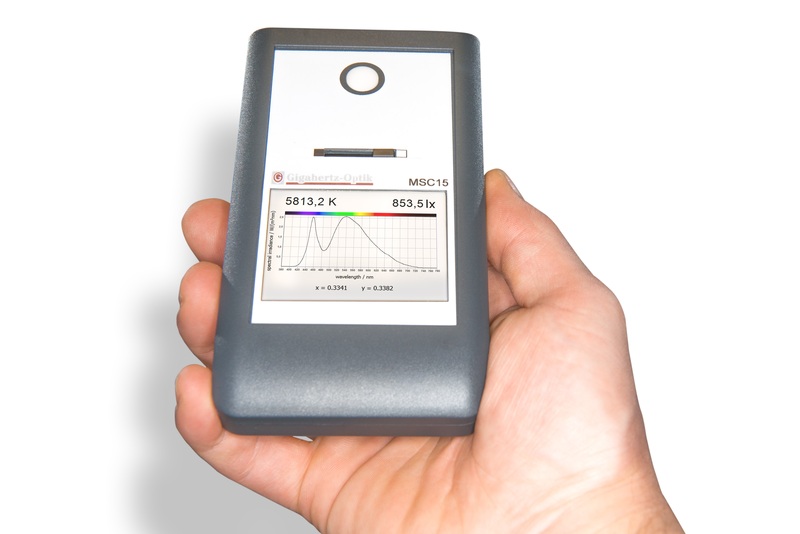 X11 and 12 four-channel optometer designed for mobile use. Compact device for use with all photometric, radiometric, colorimetric, plant-physiologic and photo-biologic measurement heads from Gigahertz-Optik. USB and RS232 interface. Battery operation or power supply USB. X1-RM optometer in 3HE housing for use in 19” racks. Its USB and RS232 remote interface and two additional RS232 device interfaces make the device highly flexible when it comes to system integration. Its four signal inputs enable use with all photometric, radiometric, colorimetric, plant-physiologic and photo-biologic measurement heads from Gigahertz-Optik. The X1 optometer is available as a printed circuit board either with or without a housing and is suited for applications that do not require a keyboard or display. Four signal inputs enable connection with all photometric, radiometric, colorimetric, plant-physiologic and photo-biologic measuring heads from Gigahertz-Optik. USB or RS232 interface. X13 broadband radiometer for UV and blue light radiation protection measurements. Mobile light meter for detection of exposure to UV radiation while working with optical radiation from artificial radiation sources as outlined in EU guidelines 2006/25/EC and Working Safety and Health Regulations for protection against UV radiation and blue light hazard from artificial radiation. Measurement of the UV and/or blue light irradiance with regards to the photo-biological effective functions. Battery operation for mobile use. USB interface. X14 broadband radiometer for radiation protection measurements of UV radiation devices. Mobile ligh meter for detection of exposure to UV radiation while working with artificial UV sources as outlined in the UV protection Act (UVSV). Broadband radiometer for measurement of the Erythema effective irradiance and detection of UV-C radiation in accordance with the UV protection Act for solaria. UVSV, DIN EN 60335-2-27 and DIN 5050-1:2010-01 conformity. Battery operation for mobile use. 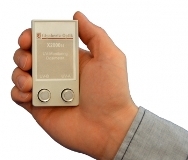 X-2000 personal dosimeter for UV radiation. Compact light meter for time dependent UV irradiance data recording. Lightweight, battery powered device with a large data memory. Different executions for the recording of UV Erythema, ICNIRP and UV-C-@-254-nm effective UV radiation dose.